Planning for your career should start as soon as you start your college career. You should begin to think about what you can do during your time at Chicago State University that will help propel you into the career that your desire. Excelling in class is extremely important, but there are other components to becoming career ready. Being involved in organizations (on- and off- campus), participating in internships, networking and utilizing all your resources on campus will contribute to your career success. What are my interests, skills that I possess or will possess once I graduate and my personal values? Am I actively engaged in my academics? Are there any clubs or organizations (career or non-career related) that I can become involved in? Am I asking for help when I need it? Do I have any plans to participate in an internship or career-related experience? What's your timeline? Figure out how long you can afford to look. Do you know what you really want to do? List skills you enjoy using, tasks that you like performing and companies you are interested in. Do you have a 30-second pitch? You should be ready to describe what you're looking for and what you can offer an employer. Do you have supporting materials? You'll need to create a businesslike cell phone message and social media presence, a resume, and a cover letter tailored to each job. Do you have a job-hunting space? It can be a library or a Starbucks- but you need a place where you can focus. You'll also need a quiet spot from which to make calls. Who's in your network? List all the communities you belong to: volunteer, sports, neighborhood, virtual, religious, high school, college, etc. Identify friends and current/former colleagues with whom to set up exploratory interviews. The O*NET database, containing hundreds of standardized and occupation-specific descriptors on almost 1,000 occupations covering the entire U.S. economy. The database, which is available to the public at no cost, is continually updated from input by a broad range of workers in each occupation. 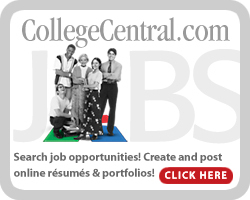 Please log in to your College Central account to search for career and internship opportunities.